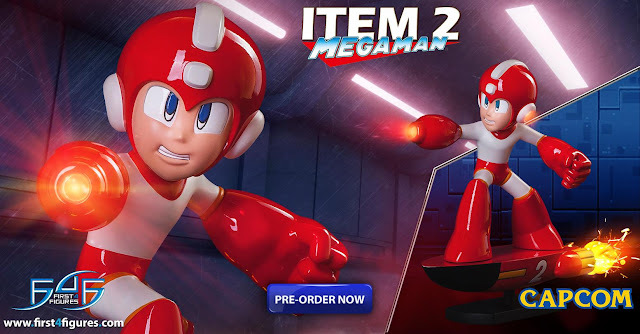 First 4 Figures has announced via Facebook that they will begin accepting pre-orders for their latest Mega Man statue, Mega Man riding Item #2, sometime today. Pre-orders were slated to go live at 11am EST but that's clearly not the case as of this writing. Rest assured, though, it's coming. In the meantime you can check out a slew of images at First 4 Figures' website. A regular ($229.99 US) and an exclusive ($269.99 US) version will be up for grabs, the latter featuring exclusive LED lights. When I was a kid I thought Item-2 was the coolest. I mean, Rush is great and all and more versatile. But he definitely isn't cooler than Item-2. There had to be a cooler way to have depicted this. I mean it's true to the art and all. But I'd much rather have gotten something along the lines of Ariga's interpretation on one of his old Megamix covers over this a hundred times over. Something about his face bothers me. It sorta reminds me of the Nintendo Power art.